Copperheads Thanksgiving weekend help three home games for the Snakes taking five for six points in total. Saturday versus Medicine Hat Cub and Sunday the Cochrane Generals both were overtime situations. Copperheads won against the Cubs (4-3) with an overtime “taking care of business” type of goal from captain Levi Anderson. Cochrane Generals ended up with the lucky winning overtime goal in that second game of the weekend (3-2). Net minder Nolan Berner stopped 60 for 66 shots in the two matches. 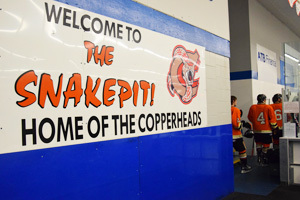 Thanksgiving Monday the Copperheads welcomed the Lomond Lakers to the Snake Pit for the first time. Lakers new to the Heritage League as of the start of the season faced a tough first experience. Copperheads were focused even after turkey, ended up taking the victory 8-0 on Thanksgiving afternoon. The shut out was credited to Taber native goaltender Broc Merkl stopping 16 shots in total from the Lakers. Levi Anderson in the three games gained five goals and two assists. Veteran Ty Abbott as well had a strong weekend with two goals and three assists. Overage player Jayden Smith collected one goal and three assists. Other roster players with three points in three games was Turner Sharp, Jared Bainbridge, Christian Dees, and Jayden Bexte. This past weekend, the Copperheads travelled to Okotoks Friday night for the first south competition with the Bisons. The Snakes played a focused disciplined game with an outcome of winning 6-2. This marked the first loss for Okotoks in regulation time this season so a big win for the Snakes. Copperheads outshot the Bisons 46-29 with Nolan Berner between the pipes. Jayden Smith with two goals and singles from Levi and Tyler Anderson, Brandyn Howg, and Mitchell Konschuk. Saturday night was an additional win with a score of 8-3. Broc Merkl had the goaltender job this evening. Another standout performance from Levi Anderson & Brandyn Howg with two goals a piece. Jared Bainbridge, Chase Williamson, Tyler Anderson and Brant Mack popping the other goals. These wins hold the Copperheads near the top of the south with a record of 7-1-1. The upcoming weekend will see no home games as the Snakes travel to Stettler.